University of Colorado Boulder atmospheric scientist Jennifer Kay has been honored with a prestigious CAREER award from the National Science Foundation, worth more than $800,000. The NSF Faculty Early Career Development or CAREER award supports junior faculty members who demonstrate excellence in research and who effectively integrate their research with education. Kay’s research, “Going Global—The Influence of Southern Ocean Albedo on Large-scale Climate Dynamics,” will focus on work to illuminate how processes occurring in remote regions, such as the Southern Ocean, affect global climate. Kay, who has been using climate models to better understand the planet’s future, is particularly interested in the vexing problem of cloud-climate interactions. Her approach involves better integrating observations, such as measurements made with lidar, or light detection and ranging, with climate models. She’s investigating the same kinds of questions in her education research, which will involve the CIRES Education and Outreach group. 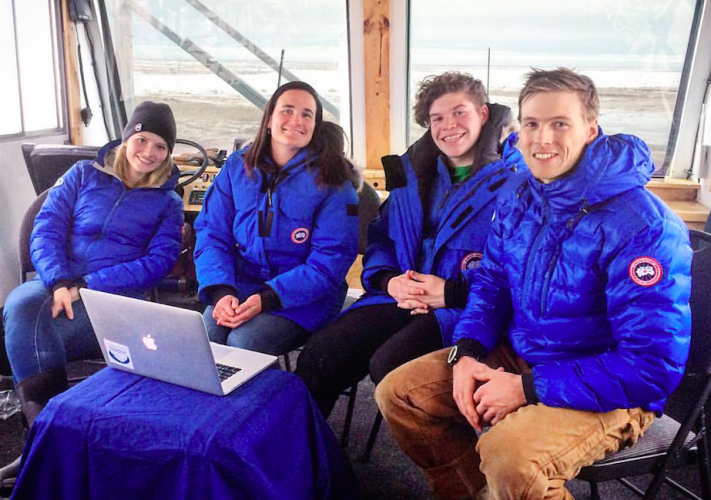 Alysa McCall, Jennifer Kay, Gerrit Wesselink, and CJ Carter get ready to teach Kay's undergraduate class at live from Polar Bear International’s Tundra Buggy One last fall. PBI photo. The Arctic bears are “cute and charismatic and people love them,” Kay said, which might inspire learning and retention of information. But polar bears are also distant from many learners. Kay, an assistant professor of Atmospheric and Oceanic Sciences, is also a Fellow of CIRES, the Cooperative Institute for Research in Environmental Sciences.